It was a Friday evening in January, the end of a long work week, and Alex’s family was sitting down to dinner at their home in Olympia. They’re a family of four: Jerry and Mary, the parents; Darnell, who’s eight years old; and Alex, a two year old. Over the past few months, Alex had often been sick: fevers, colds, ear infections. It worried his parents, but they had recently taken him in to see their pediatrician, who had been treating the kids since Darnell was a baby. The pediatrician had taken some blood and some x-rays, and promised to be in touch. Mary was just happy to have someone she trusted looking into it. Just as the family was sitting down to dinner, the phone rang. It was the doctor, and she had bad news: Alex’s blood work showed that his red and white blood cell counts were dangerously out of balance. She suspected that he had leukemia, and they needed to take him to Seattle Children’s Hospital right away. Dinner was forgotten. The family packed a few things in a bag and got in the car. But it was a Friday evening, rush hour, and they hit traffic. So they crawled along I-5 toward Seattle, Alex and Darnell in the backseat of the car, brake lights stretching out ahead of them for miles through the darkness. Jerry and Mary were high school sweethearts; they met when they were sixteen. They married in 2007, and both the kids grew up in Olympia. 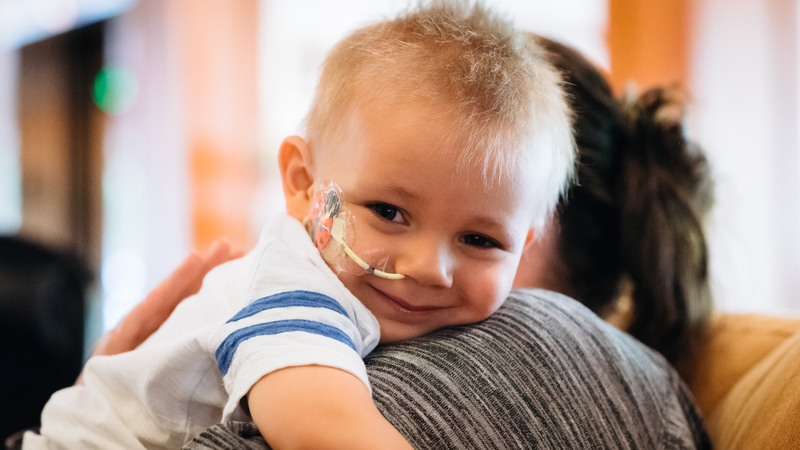 Alex was discharged from Seattle Children’s after four days, but he still needed ongoing treatment, so the family moved directly into the Ronald McDonald House in Seattle. At first, they were nervous about the transition to a communal lifestyle. Over time, the family settled into a routine. During the week, Jerry stays in Olympia and goes to work. Darnell goes to the Hutch School, a nonprofit that provides education to children living in Seattle temporarily due to a serious illness in the family. Mary and Alex go to his appointments at the hospital and walk through the parks around the House. When he naps during the day, she works part-time as a claims associate. As the family has gotten comfortable at the House, they’ve discovered many things that make a big difference to their day-to-day lives. For one: the volunteers and facilities staff who clean the House. Even though all four members of the family share a room at the House, the family also appreciates the space that’s available to them here. One side effect of Alex’s treatment is insomnia, and he often wants to wander around in the early hours of the morning. At home, this wakes up Darnell, but at the House, Mary or Jerry can take him down to the play areas in the lobby or the basement. Our donors and volunteers help us support families like Alex’s. To find out more about how to get involved, check out our Donate and Volunteer pages.